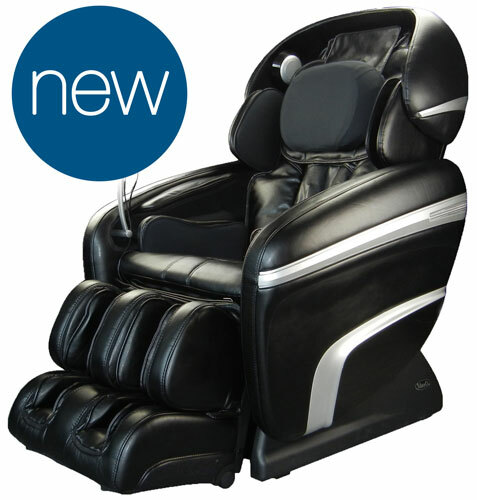 The Massage Chair Experts at Emassagechair.com are excited to introduce the Osaki OS-3D Pro Dreamer Massage Chair. The 3D Pro Dreamer boasts 3D Roller technology for ultimate control of the roller pressure and Computer Body Scan GPS for accuracy. The customization of the roller pressure and massage intensity has been profoundly changed by the 3D Massage technology. With 6 levels of depth ranging from medium to deep pressure, the feeling is more humanistic than ever before. The Osaki OS-3D Pro Dreamer is quickly becoming a customer favorite. The customization of the roller pressure and massage intensity has been profoundly changed by the 3D Massage technology. 3D Rollers travel up and down the massage roller track as normal massage chairs do, however they also have a mechanism to move the rollers forward and back. Consider the hands of a massage therapist and their motion. They have the ultimate range of motion and the ability to place more or less pressure by moving their hands forward into the muscular tissue and back to lighten the intensity. You can see then how amazing the inclusion of 3D rollers to a massage chair is. With 6 levels of depth ranging from medium to deep pressure, the feeling is more humanistic than ever before. The 3D Rollers will not work properly if they are not paired with body scan technology to tell them where to go. For this Osaki uses Computer Body Scan GPS which digitally maps the entire spine for precise placement of the rollers. Customers can see the scan occurring at the start of the session on the LED screen of the remote. Each scan takes just a few seconds placing gentle pressure along the spine as a massage therapist would. Pressure sensors report the data back to the massage chair in order to give the user a thorough customized massage experience. Now the rollers take care of most of the massage to the back and spine, however the airbags provide massage to the rest of the body. 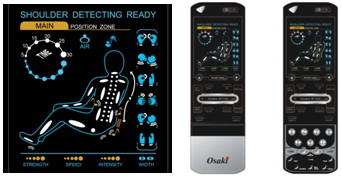 Giving the OS-3D Pro Dreamer yet another advanced feature, Osaki developed a full body air compression system that administers soothing pressure to all of the sore and tense areas of the body. With airbags literally everywhere, at the hips, low back, arms, shoulders, calves, as well as the feet, circulation and pain relief are achieved throughout the whole body. “The hip and waist squeeze in combination with the rollers really work out tension in the muscles of the low back. They help to keep you in the right place in the chair and allow the 3D rollers to do their job”, says James a Massage Chair Expert. If there are shoppers out there with sore feet from standing all day or have underlying foot issues such as arthritis, the OS-3D Pro Dreamer is the chair they need! This chair has reflexology foot rollers under the foot in the ottoman that place gentle pressure to the soles of the feet eliminating foot pain and fatigue on contact. Again the airbags provide an important element by squeezing the foot and allowing blood flow to the feet as the rollers knead away discomfort. Osaki uses quad style rollers in the OS-3D Pro Dreamer for their ability to grasp and knead the muscular tissue like the thumb and forefinger of the human hand. The massage chair has an updated S-Track roller path contoured more accurately to the curvature of the human spine, moving the rollers up and down the back with precision. Ease of use is almost as important as the actual massage mechanisms of the massage chair. What good are all these fancy features if they are impossible to figure out? Osaki thought of this when designing the easy to use streamlined LED remote. The user can simply select one of the 8 auto programs that blend numerous massage techniques in relaxing combinations or they may choose a specific technique at the touch of a button. The user can customize further by choosing any of the many manual settings, allowing adjustment in roller speed, location, intensity, and massage type. “I love the Zone feature…it lets me choose a specific area of my back to be massaged over and over! In my case the shoulder region is where my tension lies, so I use the Zone button to zero in and work out my tightest most uncomfortable area”, says Heather, a Massage Chair Expert. The OS-3D Pro Dreamer is designed with the absolute comfort of the user in mind. First sitting in the chair the user will sink in to the plush recliner. The warmth in the low back begins to alleviate pain and loosen the muscles. Zero Gravity recline will then lift all of the pressure off of the spine and low back. With plug and play MP3 Music capability and a dome for sound and privacy, worries will quickly melt away. Using the Music Synchronization the beat of the music is paired with the motion of the rollers for yet another level of relaxation. Add to that Chromotherapy lighting known for the relaxing blue hue, this chair sounds (and feels) like a piece of heaven. If you have any questions about the new Osaki OS-3D Pro Dreamer Massage Chair, you can contact a Massage Chair Expert by dialing 888.360.9996. Emassagechair.com is a leader in the massage chair industry providing expert massage chair knowledge and excellent customer service.